There is a big difference between WHAT I Am and the “whats” or data that can comprise the many contextual views to be made possible by CLOUD and CTML. As we have discussed elsewhere, for example, an electronic health record (EHR) or my stock portfolio are actually just contextual views of a specific set of “whats” pulled together into a composite contextual view. 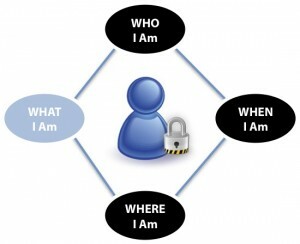 That overall contextual view of either my health or financial ‘whats’ is what CLOUD calls WHAT I Am. Of course, this broader contextual view is highly dependent on the other dimensions of WHO, WHEN and WHERE. Let’s stroll through a couple of examples to make this more concrete. In our current thinking about EHRs, we seem to see them as simply big electronic manila folders of all of our health information. We are trapped in this view because we are only looking to make electronic our current paper-based approaches. This paper-based model has not changed much since the introduction of the Gutenberg press that launched the Renaissance. In the case of the Gutenberg press, it made an already existing paper-based model of communication easier, more efficient and less costly. If one thinks of the Internet as a virtual printing press, then the shift is even bigger, because the paper goes away completely. Unfortunately, we’re still using the Internet as an electronic courier service for documents when the Internet offers the opportunity for a systemic shift not just a process shift. Rather than just applying technology to current problems; technology offers the ability to do things differently. I speak more on this idea of paper trapping our thinking in A View from the CLOUD: The Shape of Finance (Part 2) posted during the Sibos conference in Amsterdam. So, how does WHAT I Am become real when I can link specific data within unique contextual fabrics? One of the contexts for my health data is the specific health care professional with whom I am interacting. Think about how we discuss this type of context currently. In the real world, when we ‘go to the doctor’s office,’ the physical context of the interaction is important because that is also WHERE my physical records are stored. In the world of the Internet, those constraints for my records no longer apply. The dimension that really matters for this interaction with my doctor is the WHO dimension, not the WHERE one. Regardless of WHERE this doctor is, what actually matters is WHO they are, because that context will determine which of my ‘whats’ are necessary for a proper diagnosis. Clearly, if my doctor is a cardiologist, then my personal health data related to that topic should be assembled into the necessary WHAT I Am for the cardiologist to have the best contextual views of my health data to ensure my continued heart health. In a CLOUD-world, the sign on the door to the doctor’s office is much less important than the tags related to their WHO profile. Of course, if that same interaction with my doctor (WHO) occurs in the context of an emergency room (WHERE), then the contextual view changes once again. It may very well be all the same data as the regular checkup, but contextually, the immediacy of a potential heart attack will suddenly bring a whole new combination of ‘whats’ to bear. If I am in the emergency room, the contextual view of my health data that may typically only be relevant to my pharmacist who is dispensing my prescribed heart medications will become vitally important to the staff at the hospital. As they consider which courses of action to take in the emergency room, they would want to know quickly the scope of other medications in my system before they infuse me with anything else. It’s all context. WHAT I Am is simply much bigger than a bunch of data elements. In the case of a heart attack, the speed of paper (whether based on papyrus or silicon) may simply not be fast enough to save my life!